Looking for ways to collaborate better with your business partners, beyond just better document exchange? Then you’re probably evaluating B2B e-commerce networks. But that landscape – and your options – are quickly changing, making your way forward harder to nail down. 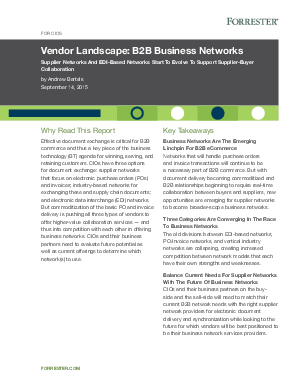 We don’t think you’ll find a more comprehensive and balanced analysis of today’s network vendors. To learn more, download your copy today.